What a food fest at Margot and Jerry HQ this week. From watercress to strawberries, Hampshire fizz to charcuterie and a bit of jam and gin thrown into the mix, I’ve seen it all. 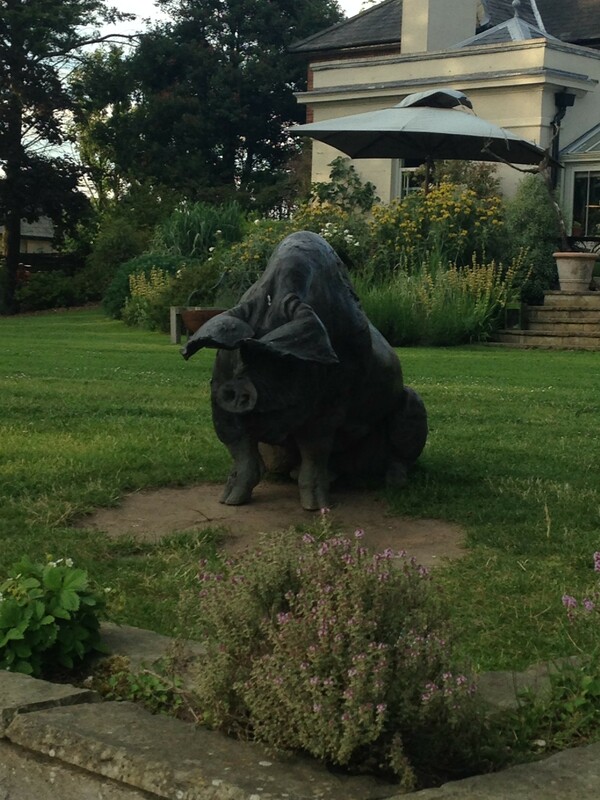 Skipping off to the launch night of the Hampshire Food Festival at none other than one of Hampshire best loved foodie haunts, The Pig Hotel at Brockenhurst (is it me or do I seem to make a habit of finding a pig everywhere I go lately??? ), I had a wonderful time chatting to lots of wonderful producers. Hattingley Valley fizz, Upham Brewery beer, Parsonage Farm charcuterie, Devese Farm Animals’ Goat pâté to name but a few as well as a new find for me, the most sumptuous lobster oil from Catch on the Isle of Wight. We are so lucky in Hampshire to have such a wealth of foodie delights on the doorstep – thanks so much to Hampshire Fare for inviting a very greedy Margot along for the evening! A considerable pity that I was driving as I would have tucked into the Hattingley fizz and Twisted Nose gin wholeheartedly…….all in the name of research I assure you, dear Reader. It is a hard job but someone has to do it! 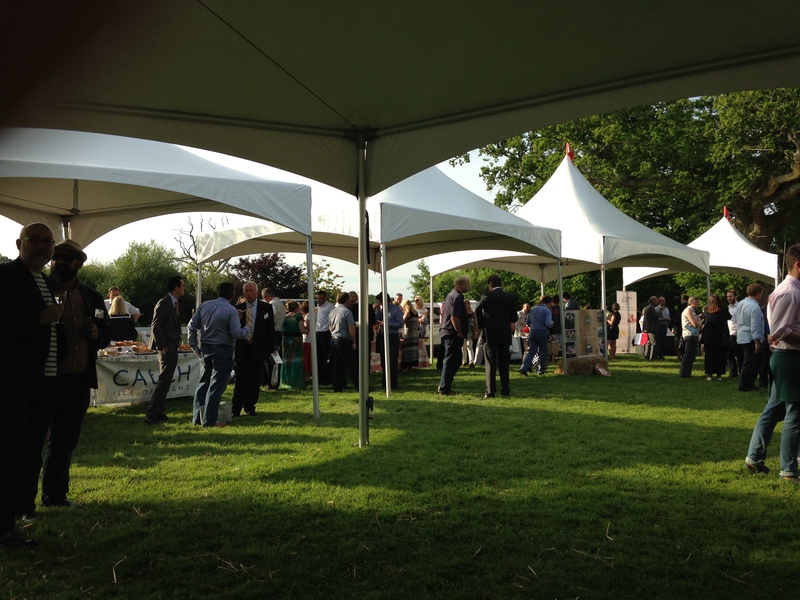 I can’t wait for all the other Hampshire Food Festival events! As for The Pig Hotel, I shall certainly be convincing Jerry to whisk me away for an evening of gastronomic heaven in its picture perfect grounds. My advice, dear Reader – seek out your local farmers’ market wherever you are. Everything is usually handmade, delicious, something out of the ordinary and best of all, it won’t have travelled too far to get to you! From The Pig to watercress…..and the lovely people at @Love_Watercress and Pam Lloyd PR who sent me four marvellous bunches of watercress to create some kitchen magic with the vibrant, iron-rich green stuff. Not wanting to go down the usual watercress salad and soup route, I set about trying something different. The favourite? 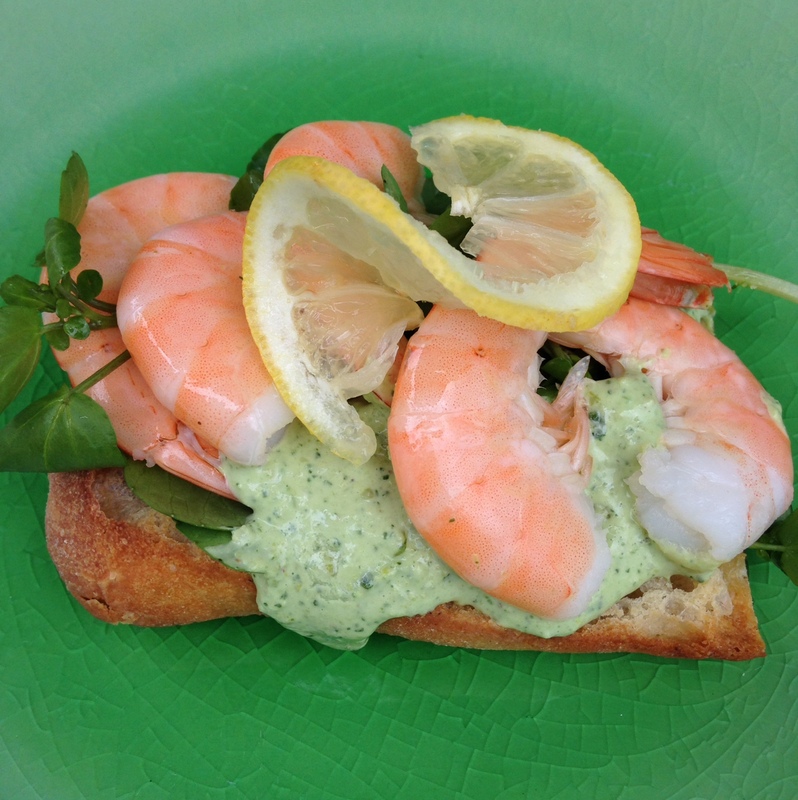 My Watercress and Pea Mayonnaise – very easy, made in seconds and a perfect partner to some prawns and toasted baguette for lunch. Whizz all the ingredients up in a food processor et voila, your work is done! Spoon liberally onto the baguette before adding fresh watercress. Top with grilled prawns and sprinkle a little smoked paprika on top for some smoky spice. It also goes rather well with smoked salmon, grilled chicken or used to top a piece of seared trout. Something rather delicious, made with almost hardly effort at all! Pity I can’t squeeze a little watercress bed into the garden! Never more have vegetables been on the agenda at Margot and Jerry HQ as our own veg patch is burgeoning under a make-do-and-mend style polytunnel. Having really got stuck in this year with growing our own, I’m surprised by how a little amount of space can bring forth such a huge amount. We’ve got enough lettuce to feed the county! My battle now commences with rabbits, squirrels, slugs, snails and pigeon. Our very own Mrs MacGgregor next door takes tending her walled kitchen garden very seriously and I have on more than one occasion come home to find errant rabbits and pigeons left on the doorstep, ready for the pot! They’d better take more care not to be caught next time. I, on the other hand, am not sure I am ready to take my veg patch watch to Depth Con 4 levels just yet, dear Reader! One significant problem according to Poppy and Primrose though…..we forgot to plant strawberries. In fact, other than a thornless blackberry plant, an autumn raspberry cane and some dead on its feet rhubarb, we didn’t manage to get any soft fruits in this year. However, with an amazing selection at a PYO very near us, we spent a blissful afternoon on Midsummer’s Day picking strawberries and talking jam. Sometimes appeasing a 6 year old and a 3 year old is relatively easy! I shall be cooking up a batch of homemade Strawberry and Lavender jam from the Margot’s Kitchen archives too – forgotten how much we all liked it until my little recipe made an appearance in The Telegraph this week. 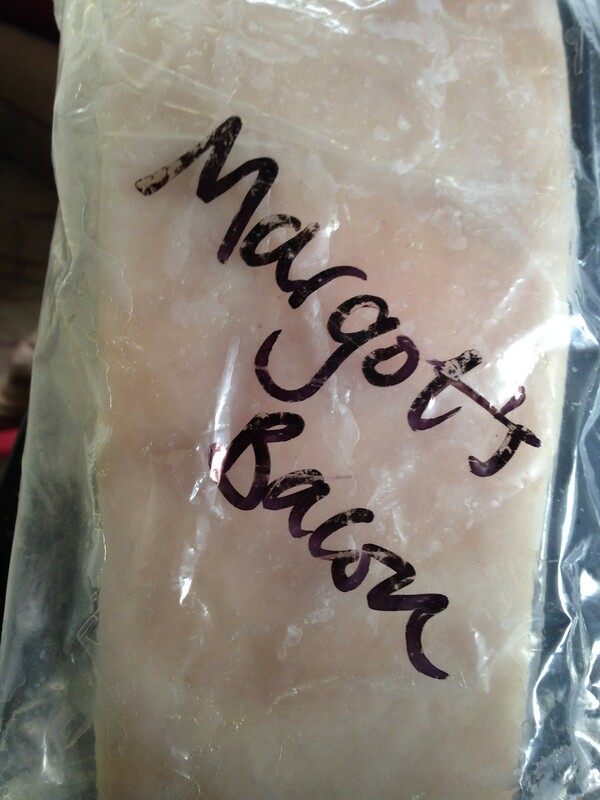 Good grief – a proud Margot kitchen moment indeed! Happy Eating, dear Reader! This entry was posted in Margot's Country Snippets, Out and About, Recipes from Margot's Kitchen and tagged Catch, Devese Farm Animals, Dinner a deux, farmers' markets, Feeding the hordes, foodie, Hampshire Fare, Hampshire Food Festival, Hattingley Valley, kitchen, Kitchen suppers, lobster oil, Love Watercress, Pam Lloyd PR, Pick, Preserve and Pickle, prawns, Strawberry and lavender jam, The Pig Hotel, The Telegraph, Twisted Nose gin, Upham Brewery, vegetable patch, watercress, Watercress and Pea Mayonnaise on June 21, 2015 by admin. Ooh dear Reader, I have been really looking forward to telling you about my latest exploits all week. As you know, I have had my eye on getting a pig but with no land nearby for sale or to rent, having my own pigs is just not an option at the moment. A huge blow but not an unexpected one. Our village is particularly anti-pig and since every field around here is prime grazing for ponies, Jerry and I have been thinking about alternatives to renting a grassy field. There must be someone nearby who needs a piggy rotivator! 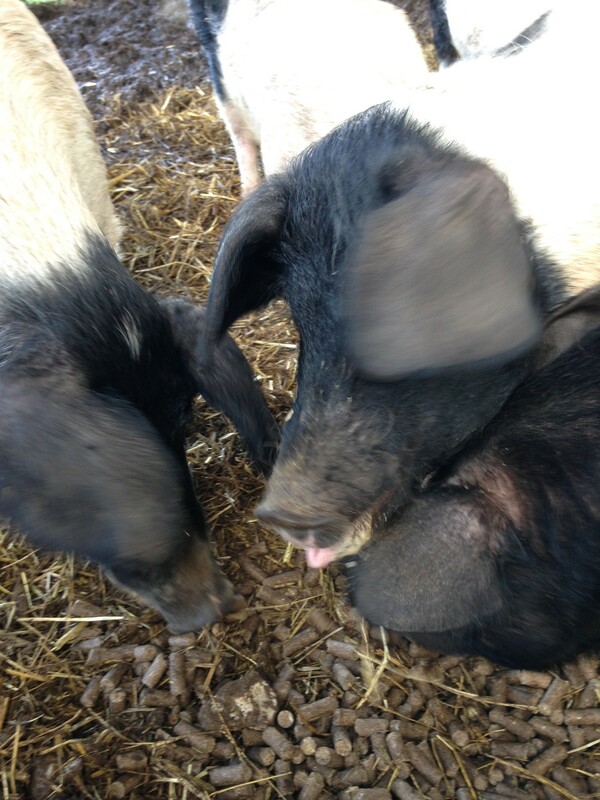 Determined to learn more about all things porcine, off I popped to discover more about the joys of pigs at Parsonage Farm and join one of John and Sarah Mills’ regular workshops. John and Sarah Mills are true advocates of field to fork eating and their livestock doesn’t travel much further than to the abattoir and back, before making it to the butcher’s block. I know I have mentioned it before but their salami and air dried ham and beef is to die for too! 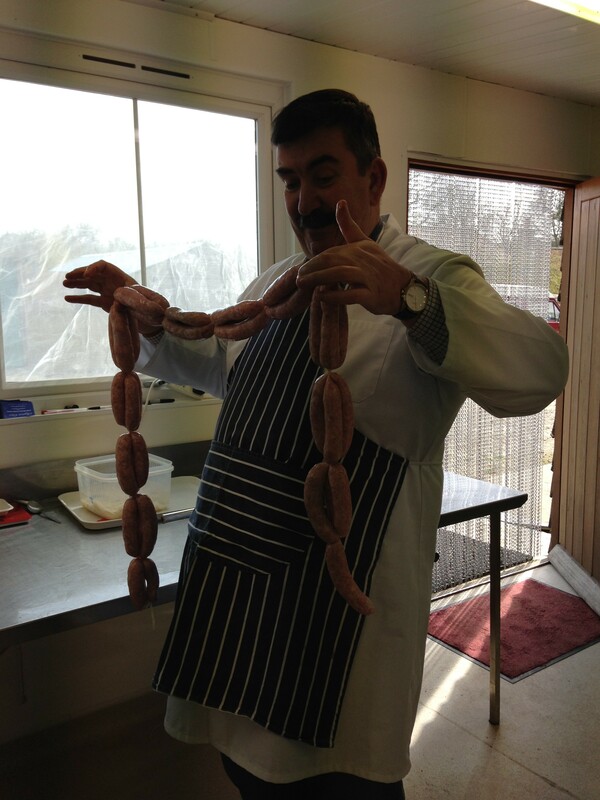 So much so that I have been dying to learn how to make my own salami as well as bacon and sausages since I met them. So, where better for a beginner like me to start than with one of their Charcuterie workshops, dear Reader? I confess, dear Reader, that I know very little about butchering any kind of animal. When our orphan lambs went to slaughter last year, we took the carcasses to a local butcher who did the job for us so going on a butchery and charcuterie workshop was high on the priority list to aid me in my quest to advance my good life skills! Taking us through from whole pig to pancetta was the wonderful Marc Frederic (Le Charcutier Anglais as he is known) who, apart from having the best butcher’s chat I’ve heard in a long time, is also a dab hand at all things charcuti (wonder if I could make that one, catch on, dear Reader…?) and his skills are known from here to Thailand. His selection of butcher’s kit is incredibly impressive too, including a rather large knife rather hilariously named a “chopper” (yes, I did snigger like a school girl, dear Reader). 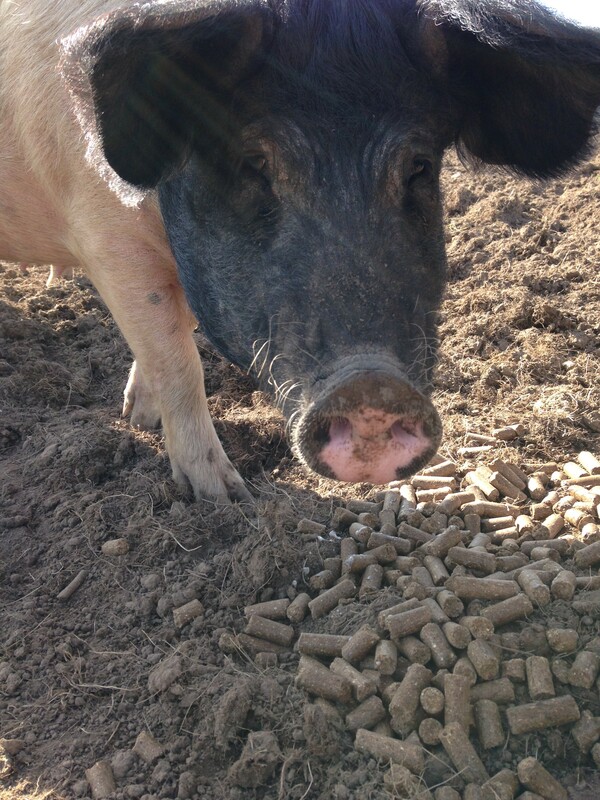 Getting down to the nitty gritty, I learn that different pigs are better for different things. For example, a Tamworth (the meat we are working on) makes a good pig for bacon as it has the ability to achieve the right meat to fat ratio. So it might be perfect for bacon and sausages but not so good for other types of charcuterie such as salami or air dried hams. Other slow growing porkers would be a better option if charcuterie was the end goal. I have to say for me, the Tamworth is my favourite of the pigs on the rare breed list – I have rather a soft spot for their russet hair and they make the cutest piglets you’ve ever seen, dear Reader. Back to pork….. 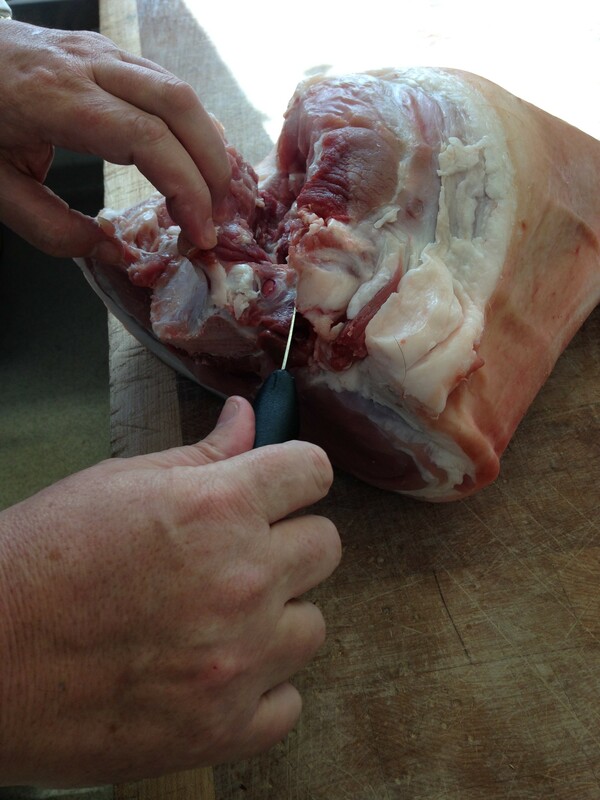 Some serious sawing, filleting skills and knife sharpening lessons later and we begin to see what you might recognise when choosing choice cuts from the butcher’s counter. There’s also a large tray of meat (and fat) that is reserved for later – offcuts from our butchery. I think that I learned more about meat in the first few hours of the course than I have in a lifetime of cooking and eating it! 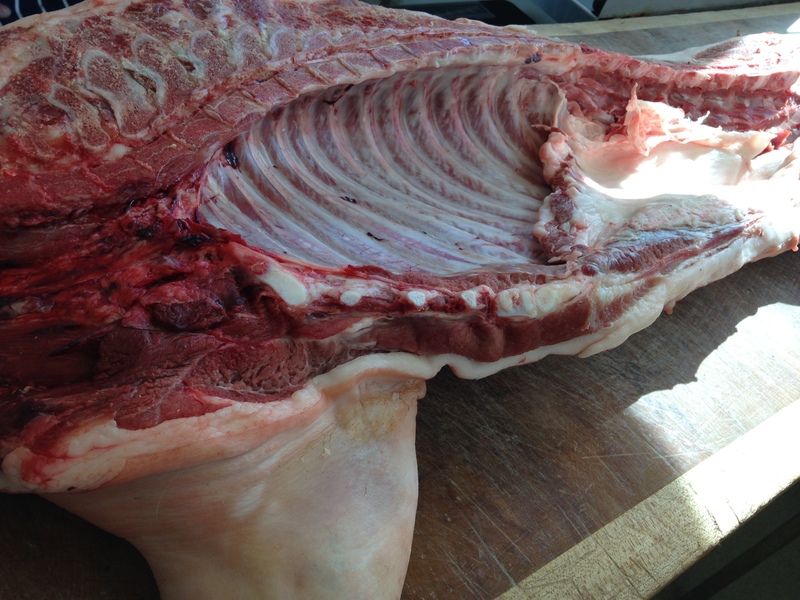 Coppa, lardo, bath chaps, trotters for gelatine……a good butcher knows how to use as much of the animal as is possible. Real nose to tail eating. Everything but the squeak but not the pesky sinews, tendons and bits of cartilage which shouldn’t even go into sausages. Marc’s knife skills (and patience guiding us beginners with the right cuts here and how close to take the blade) are amazing. It turns out that I have been sharpening my knives at home completely the wrong way for years. 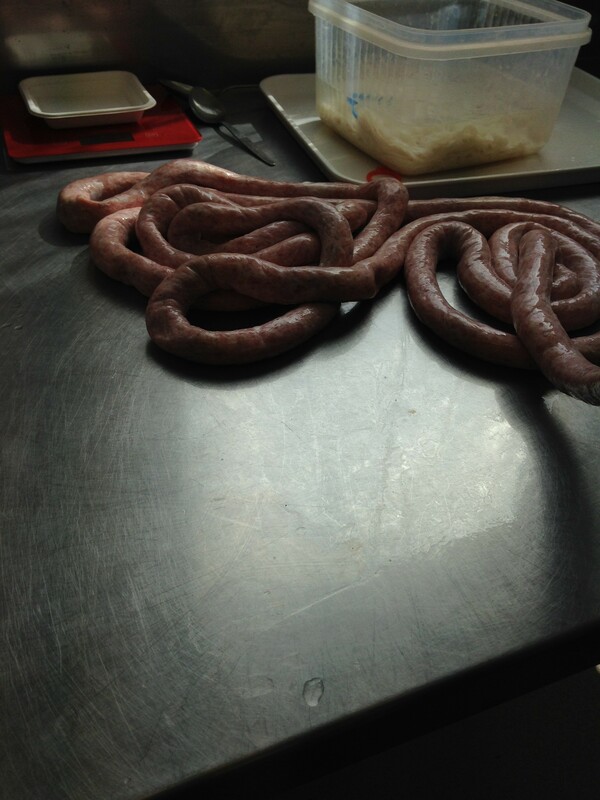 Sausage making was hilarious! I can’t wait to get my own kit. Brilliant fun and so easy once you know how. The best bit with making your own sausages is that once you’ve mastered the basics, you can begin experimenting with flavours and create your own sausage recipes. Endless hours of fun in my book! Marc made it all look so easy. Getting the hang of the sausage machine certainly had me in fits of giggles but then, dear Reader, I have never been known for my maturity! Almost impossible not to think of every sausage (and sausage skin) innuendo in the process but in the end, I was quite proud of my handiwork – not too embarrassing for a first try. Tying them is a real skill I can assure you, dear Reader. I made sure that I shot a video of Marc’s demonstration because I knew that I would never remember any of it when it came to having a go at home! Perhaps the most exciting part of the whole day for me was learning how to make bacon – something I could definitely see myself doing at home. 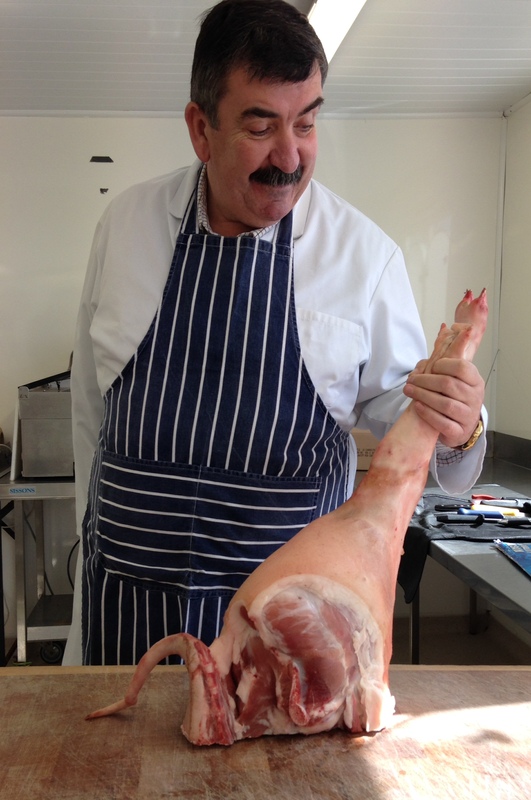 Marc showed us how to prepare the pork for curing and the steps needed to create our very own pancetta. A fantastic day, dear Reader – I can highly recommend it and Marc’s insight and teaching alongside his witty repartee made the day full of fun as well as learning. I loved every minute of the workshop and Sarah and John’s delicious lunch was a triumph and a reminder of all the amazing things that can be done when care and respect is given to bringing food from the field to the table. I can report that the bacon after its seven days curing was well worth the effort! Jerry, Poppy and Primrose are already wondering when I shall be making some more. I’ve even been looking for meat slicers and sausage machines on Ebay! Now if I could just find somewhere to put these little beauties! You know me, dear Reader, never take no for answer……so keep this to yourself, but I may already have a plan in mind! Oink oink! This entry was posted in Margot's Country Snippets, Out and About, Recipes from Margot's Kitchen, The Farmyard, Uncategorized and tagged air dried ham, bacon, butcher, butchery workshop, charcuterie, curing bacon, field to fork, Hampshire Charcuterie, Le Charcutier Anglais, livestock, Marc Frederic, meat, nose to tail eating, pancetta, Parsonage Farm, pigs, pork, rare breed list, salami, sausage making, sausages, Tamworth on April 26, 2015 by admin. 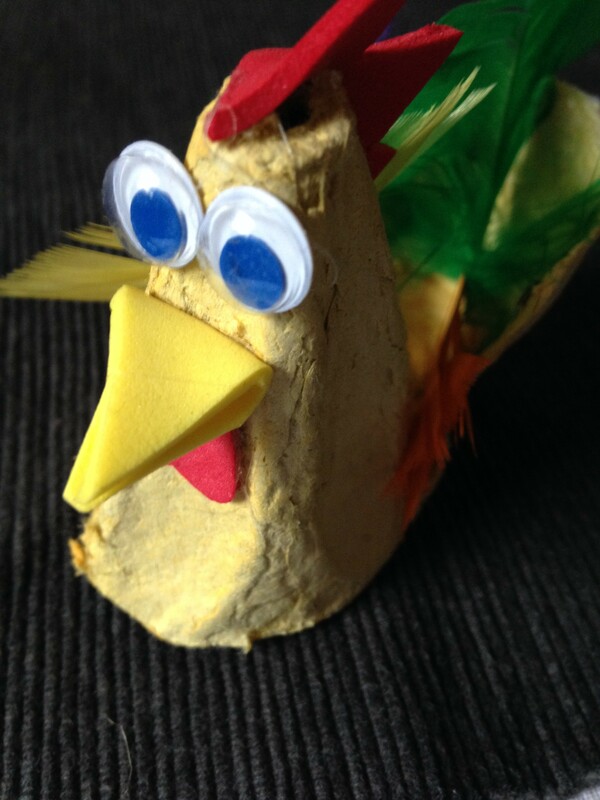 With spring flowers, chicks and eggs both chocolate and hen, Easter is certainly hot on our heels. A little rabbit even crept onto the table too (thanks to Pol Roger Champagne for inviting me to share a dinner party favourite), leaving Poppy completely appalled that Mummy and Daddy might have kidnapped the Easter bunny and eaten him! However, Easter just wouldn’t be Easter dear Reader, without lambs. Bouncing little bundles of spring joy. In fact, Poppy, Primrose and I have been reminiscing about our orphans from last year and wondering about a few more. Since I don’t have any grazing of my own to speak of, finding willing landowners happy to part with a field for six months is pretty tricky. So, missing my three bleating little ones, I decided to offer my very inexperienced services to a lovely local (very patient) shepherdess whose flock was about to triple within a matter of weeks. The maternity wing was already full of triplets when I got there and in the biting wind and driving rain, the shed was by far the best place for lambs, ewes (and Margot) to shelter. Keen to put me to work, the shepherdess had me learning the ropes in no time – docking tails, castration (cross your legs – it’s all about the rubber bands)….checking feet and monitoring newborns. Even the polytunnel had been cleared out to be used as a makeshift intensive care unit for difficult births and struggling lambs. Such a lot to get done before the next birth and all that while you’re on red alert for any ewes who look as though they might be going into labour. Scanning and dating I learn, is no real guarantee of just when lambs might make an appearance and the shepherdess has her trusty notebook with her at all times, referring to notes on when each ewe is due and how many babies. Some are first timers, others are old hands at lambing and will be giving birth for the third or fourth time. First timers are always more of a worry, the shepherdess tells me. 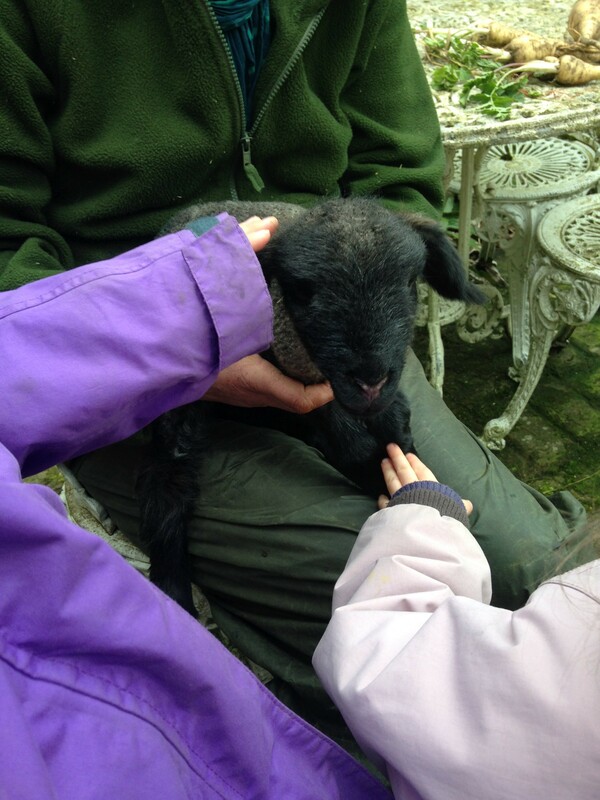 Lambing is a curious thing….much like giving birth to human babies. A lot of waiting around, a bit of action, a lot more waiting around and then everything happening in a matter of ten minutes. 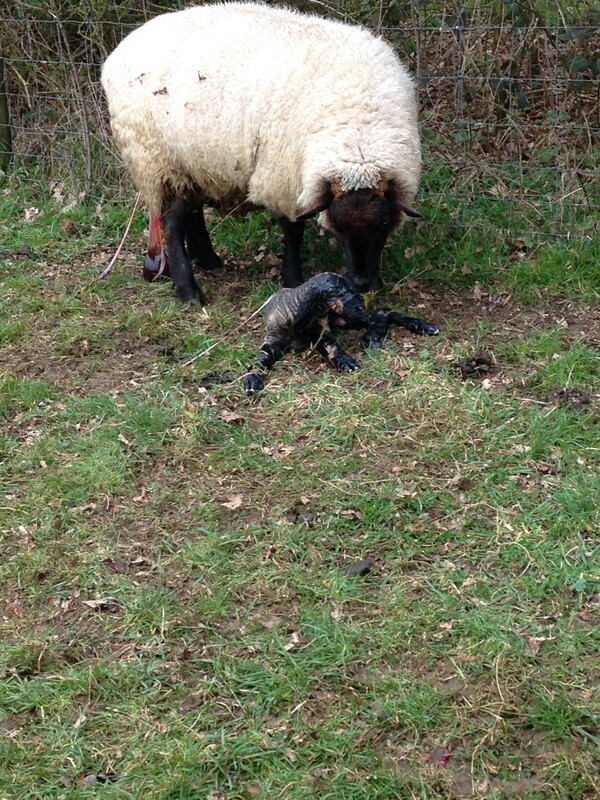 Reading my sheep husbandry handbook was no real preparation for witnessing my first live lamby birth – it was amazing. Even more wonderful to be there ready to assist when one lamb got a bit stuck in the process and the ewe had to be helped out. 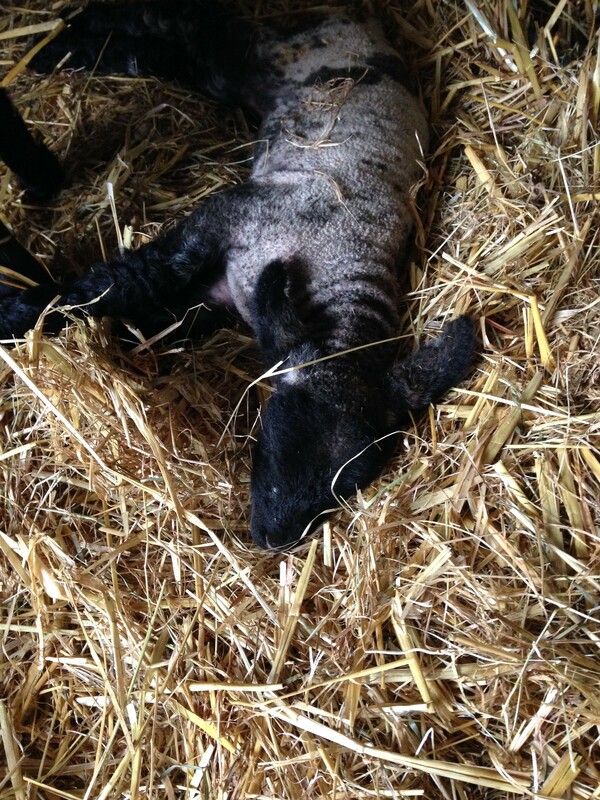 Oooh, dear Reader, this was truly Lambing Live and I was standing by like James Herriot in the middle of a field, with a bucket full of delivery essentials and a shepherdess sporting a long plastic glove. I think that the shepherdess was rendered quite dumbstruck when I got out my phone and starting taking pictures….. Oh the shame, dear Reader, I am a complete total farming amateur! Too good to miss recording it for the children to see later that day though! 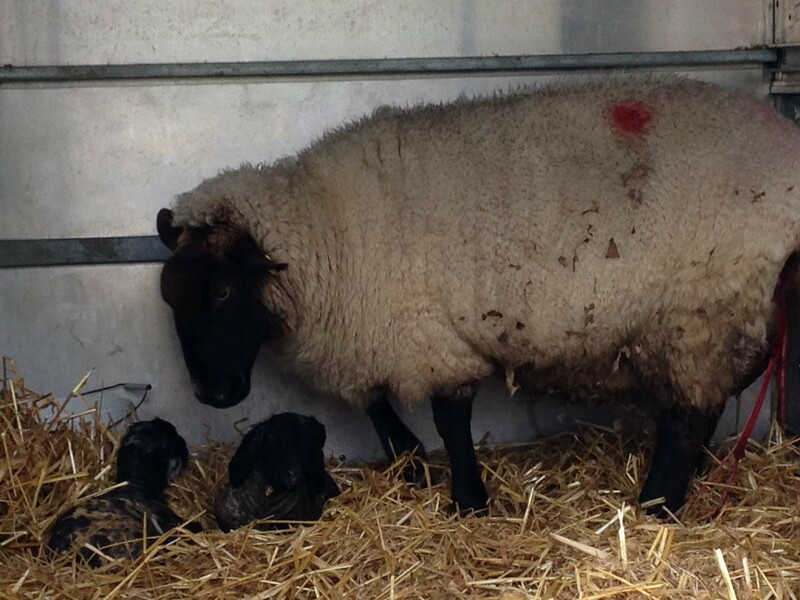 When the second lamb popped out unaided fifteen minutes later, all hands were on deck to get the newborns and ewe into the trailer before the wet lambs became too cold up at the top of the field. All this care, love and attention for something that will eventually reach the table. I am in awe of the work all our farmers do and how much effort goes into bringing meat to consumers. Keen to get more practice in, I popped over with Poppy and Primrose to see how the rest of the ewes were getting on a day or so later. 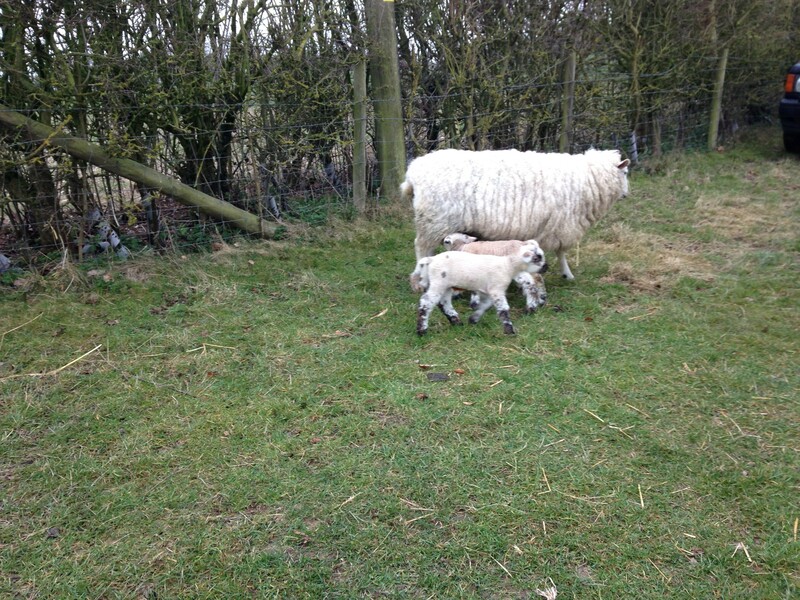 Tons more naughty scampering triplets and happy ewes! Anyone who thinks that sheep don’t have much personality couldn’t be more wrong. You can see just what kind of mothers they are by watching them for five minutes. Poppy and Primrose spent an hour running up and down the fields with lambs following and gambolling, their mothers watching on or trotting behind. Definitely what Easter in the countryside is all about! Much to the girls’ delight, there was even a spot of newborn cuddles to be had. One of the shepherdess’ more troublesome ewes had given birth to her triplets just the night before our visit and one of her babies had really really struggled to perk up following the trauma of birth. Dubbed Minnie, we found her in the kitchen in a cardboard box. A tiny little thing and destined to be fed by bottle for the moment as she hasn’t had much strength and is considerably smaller than her siblings. Snuggling up to a newborn lamb has to be the highlight for Poppy and Primrose this Easter – much better than a chocolate egg any day they told Jerry and I afterwards in the car on the way home! Looks like little Minnie may well be needing a foster home too………….the prospect sent me scuttling to the garage to get the huge bottle of Milton and lamby bottles out again. Despite Jerry rolling his eyes, there may well be a cardboard box with a lamb in it in the kitchen very soon! Well how could we resist such a darling little face, dear Reader?!!! Happy Easter! This entry was posted in Margot's Country Snippets, Recipes from Margot's Kitchen, The Farmyard and tagged birth, bottle feeding, chicks, Dinner a deux, Easter, Easter bunny, eggs, ewes, farming, James Herriot, Kitchen suppers, lamb, lambing, Lambing Live, maternity, newborn, orphan lambs, Pol Roger, rabbit, sheep, sheep husbandry, shepherdess, spring, triplets on April 4, 2015 by admin. It’s not often that I get so engrossed in a new cookbook that I end up pretty much cooking every recipe from cover to cover. However, the latest offering from Ebury Publishing to land on the doormat was something rather special. If you are a mother (or father – let’s not have any gender stereotyping here, dear Reader) and you love cooking, this is the book for you. It’s a wonderful example of how family cookbooks should be – completely unpatronising and all about cooking dishes that the whole family can enjoy together. 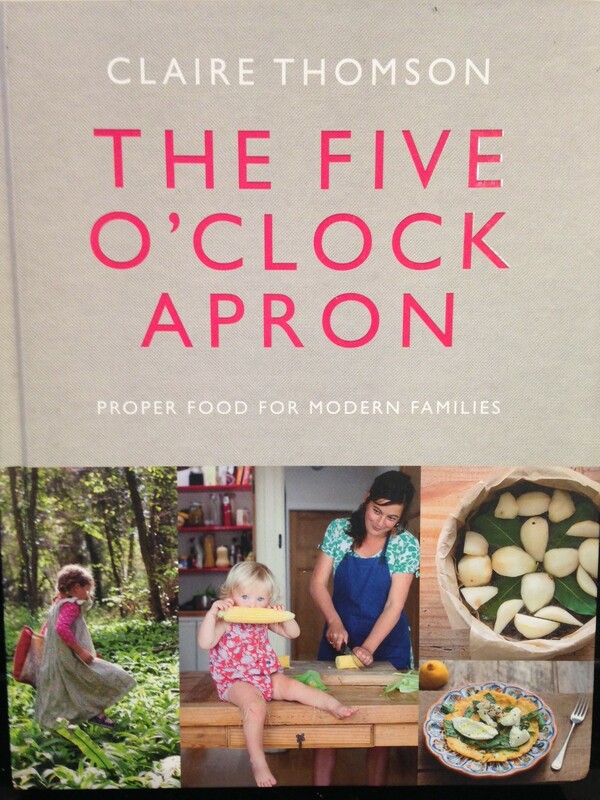 Dear Reader, I give you The 5 o’clock Apron: Proper Food for Modern Families by Claire Thomson, mother of 3, chef, restaurant owner and all round fab foodie (in no particular order). With poor old Poppy ill for the last month with tonsillitis and then various mystery bugs, the book could not have been more timely. Tempting her to eat has been pretty tricky so I was exceptionally grateful for some new culinary delights to cajole her back into nosh. Easy Peasy Rose ice cream was a godsend and easily whipped up in minutes for a little one who could not eat much. I tested it out on some grown ups too at a dinner party and they’ve been clamouring for the recipe ever since. Just for the record, I am NOT sharing this one – it’s too good to share. Trying new things is what this book is all about. 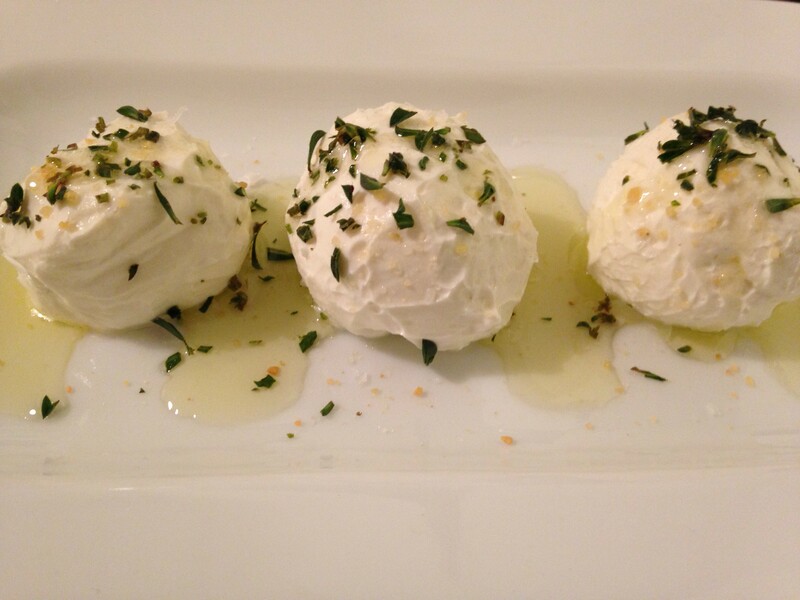 With that in mind, I had a go at making some Labneh – a recipe that was completely new on me. This yoghurt based soft cheese is so easy to do and tastes wonderful in both savoury and sweet variations – it has been a revelation to be honest. Who would have thought that with almost no kit and just some salt and yoghurt, that you could knock up a delicious cheese overnight? Genius. I shall be making this with the girls over and over again. Perhaps the reason I loved Claire’s book so much is that I could really relate to the reasons she decided to pen these recipes. I often find myself cooking meals for the children and then something else for Jerry and me and the time it takes to cook more than just one meal is time I could be doing other things……. (daily mantra: get that piece of writing finished, Margot). I think that we all make the mistake of thinking that children can’t cope with gutsy flavours or aren’t interested in trying new things. Well with most, that simply couldn’t be further from the truth. 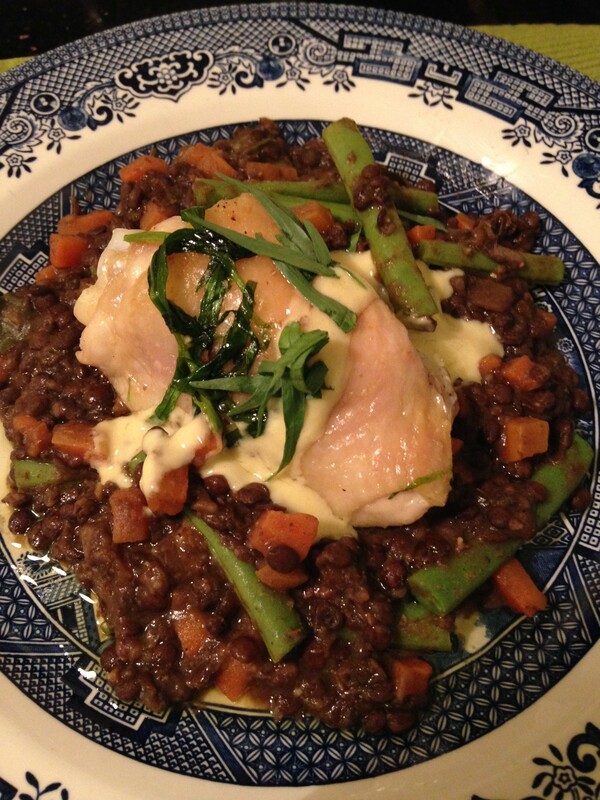 Certainly when it came to testing out Claire’s new recipes on Poppy and Primrose, moving away from our boring midweek staples of lasagne and chicken risotto made the food much more exciting! As Claire writes in her book, “Make food interesting”. 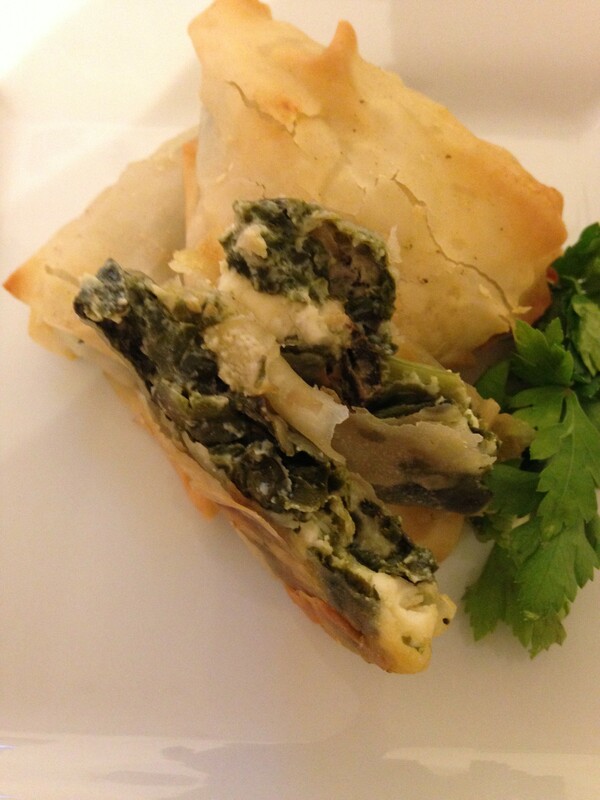 Delicious Chard Borek – great handheld after school fodder. Honestly dear Reader, there is not a dud recipe in this cookbook. So I urge you to step away from Wednesday night’s spag bol rut and liven up the supper table with recipes such as Chicken Shawarma and hummus, Cassoulet or Sweet and Sour Chicken Wings with ‘slaw. Why not have Snail bread for breakfast or Ginger Beer scones for afternoon tea? It’s not about making mealtimes more time-consuming or complicated. Believe me – this book will SAVE you time! Make The 5 O’clock Apron the family cookbook you buy this year. You won’t regret it. Have a look at some of Claire’s fab recipes from The 5 O’clock Apron on The Happy Foodie site too. This entry was posted in Margot's Country Snippets, Recipes from Margot's Kitchen and tagged chard borek, Chicken Shawarma with hummus, children's tea, Claire Thomson, cooking for mummies and daddies, Easy Peasy Rose ice cream, Ebury Publishing, family cookbook, Feeding the hordes, foodie, labneh, mother, new family recipes, saving time, The 5 O'clock Apron, The Happy Foodie on March 7, 2015 by admin. Getting enough fruit and veg into my lovely lot is never far from my thoughts at mealtimes here at Margot and Jerry HQ, not least because now we have begun to grow our own in the kitchen garden too. I say, kitchen garden, dear Reader….. I think that a more adequate description at present would be – 1 raised bed with a handful of rather battered seedlings which have been gobbled at by fat pigeons with a voracious appetite for brassicas. It would be safe to say that the kitchen garden definitely needs work. 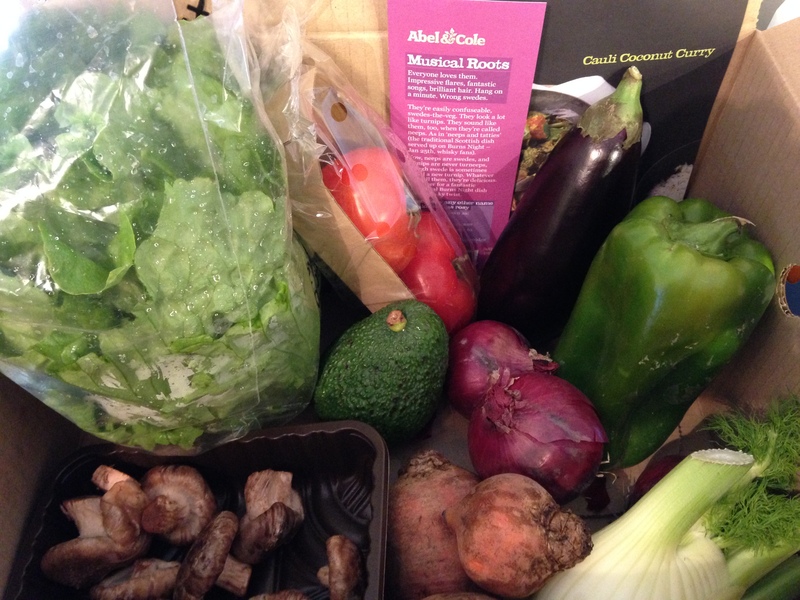 However, just in the nick of time, a rather lovely box of gleamingly healthy vegetables appeared by the back door, courtesy of Abel and Cole, – something to save us from the great kitchen garden famine of 2015. 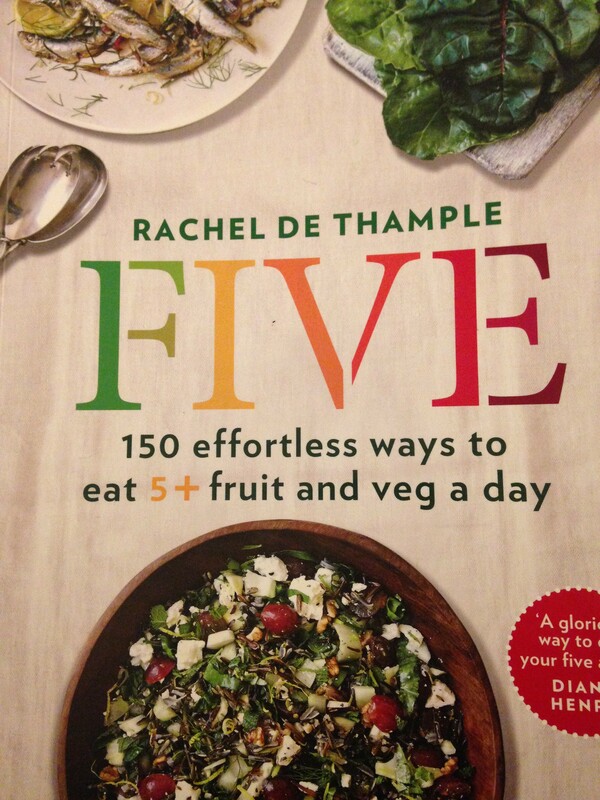 With it, came the arrival of a new cookbook from Ebury Publishing – Rachel de Thample’s Five: 150 effortless ways to eat 5+ fruit and veg a day. The perfect combination for my latest #Happyfoodie challenge, dear Reader – 5 new recipes in 5 days. Rachel’s book is not just for vegetarians (there’s something for meat eaters too) but there is an emphasis on eating ‘less meat, more veg’. With plenty of portable snacks, quick lunches and feast menus on offer, there’s certainly food for thought between the pages with a large helping of fruit and veg! Some lovely ideas for foraging for ingredients too. Changing habits is never easy and although I am known for my ninja style hidden vegetables in dishes, the book armed me with plenty of new ideas of how to introduce more fruit and veg into our diets without any extra fuss or each meal becoming completely vegetarian. 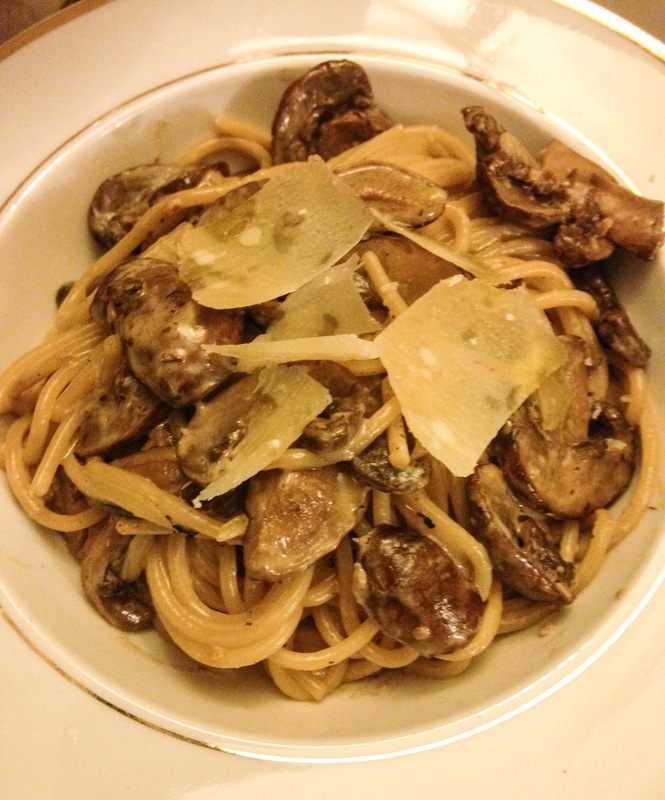 Espresso mushrooms with tagliatelle (3 portions of veg per serving) – an odd pairing of coffee and mushrooms you might think but surprisingly delicious. The coffee takes a backseat on the tastebuds but it really makes the mushroom sing with its earthy flavours. I had spaghetti to hand in the larder rather than tagliatelle but Rachel’s little notes that accompany the recipe give plenty of alternatives if you don’t have the exact ingredients to hand or need to swap them for any reason. 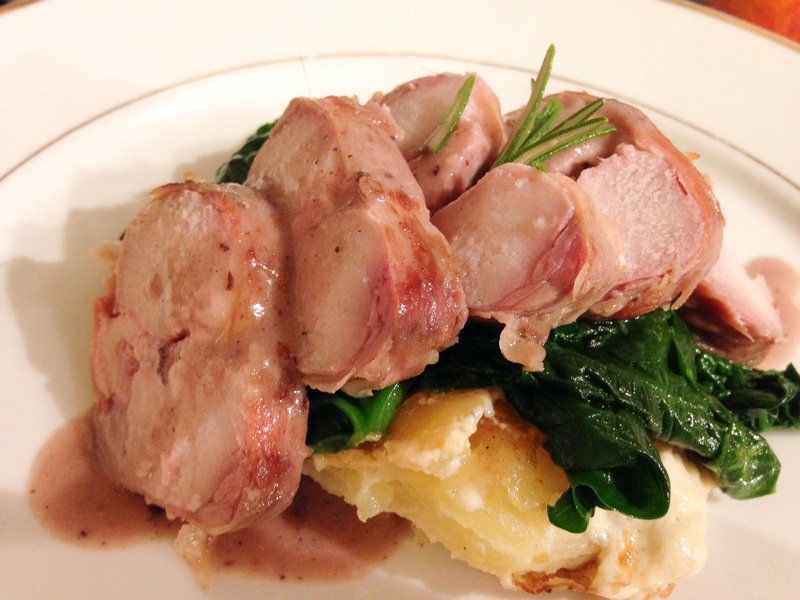 This dish won Jerry over straight away so definitely one to commit to culinary memory. A delicious Monday meat free supper which can be whipped up in 20 minutes. 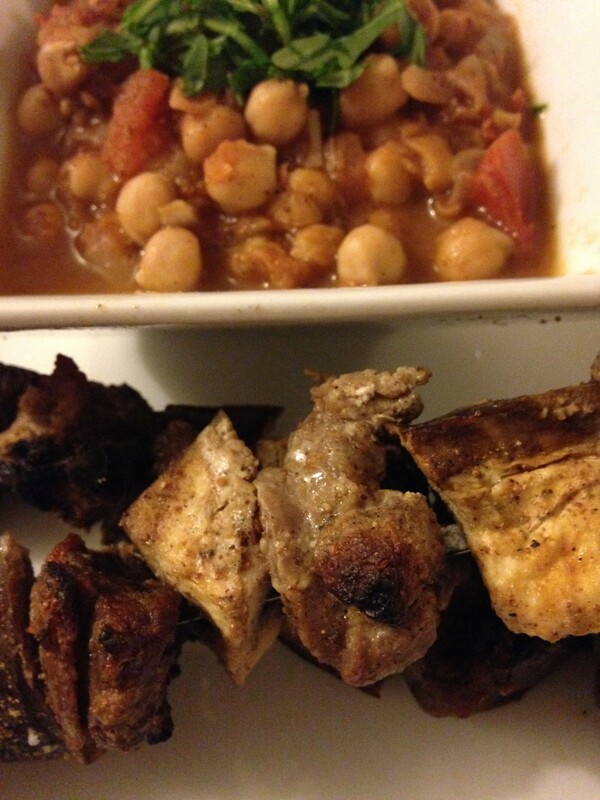 Tuesday and Chloe Chickpeas with Spiced Lamb Skewers and Herb Yogurt (4 portions of veg per serving). With snow on the ground at home, this was a wonderfully warming North African number with a gentle chilli and cinnamon spicing in the chickpeas. The best bit of the dish has to have been the lamb and aubergine skewers marinated in yoghurt and Rachel’s recipe for homemade garam marsala. I had no idea garam marsala was so easy to make so I will adding this to my list of homemade ingredients from now on. 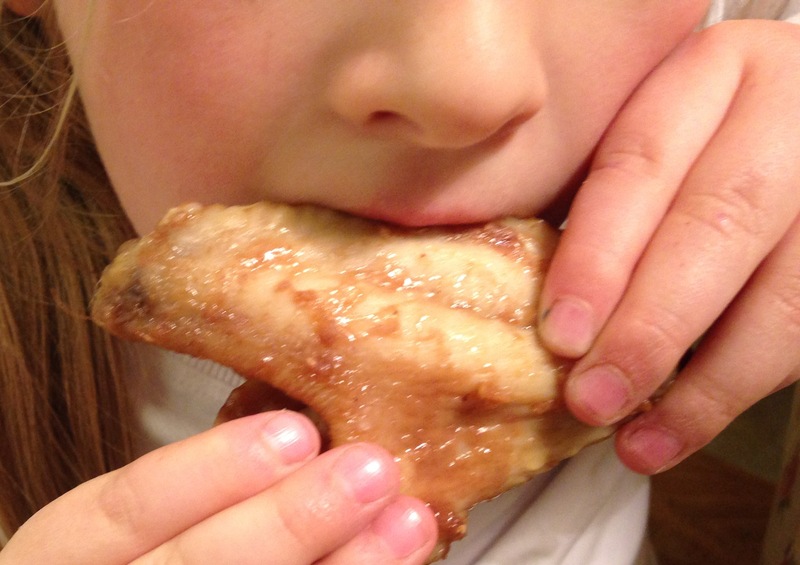 Wednesday’s #fivechallenge saw the most delicious recipe so far. A cosy supper for Jerry and I of French Puy and Green Beans with Chicken and Mustard Crème Fraiche (3 portions per serving). Heaven on a plate and lots of healthy veggies to boot! Time for a change to my normal coffee fuelled Thursday morning. 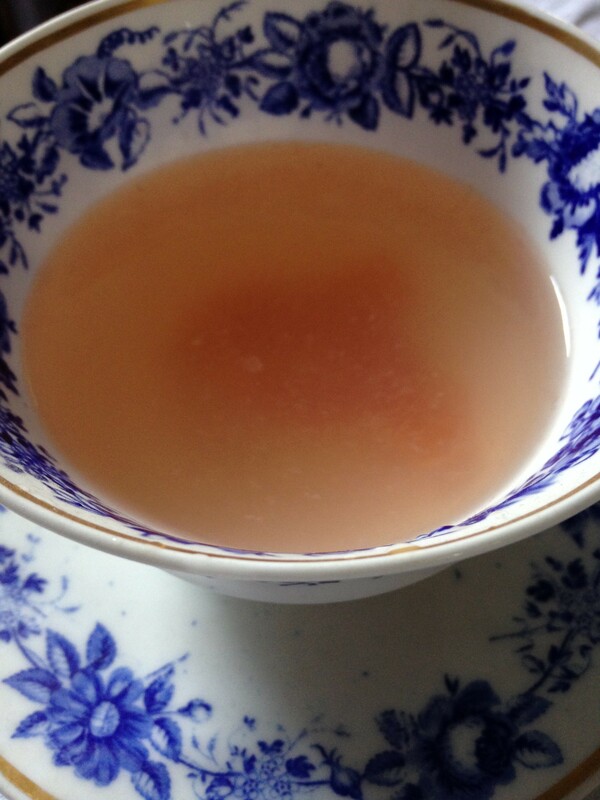 Rachel’s recipe for Grapefruit and Ginger tea – a sheer delight and so simple to make. Zingy, cosy, a great way to detox or swap your usual caffeine and with 1 portion of fruit in the pot, another easy way to get that #fiveaday. The last of the five? Rosy Pomegranate Panna Cotta (1 portion per serving) – a great dinner party pud made in 10 minutes and set in just an hour. 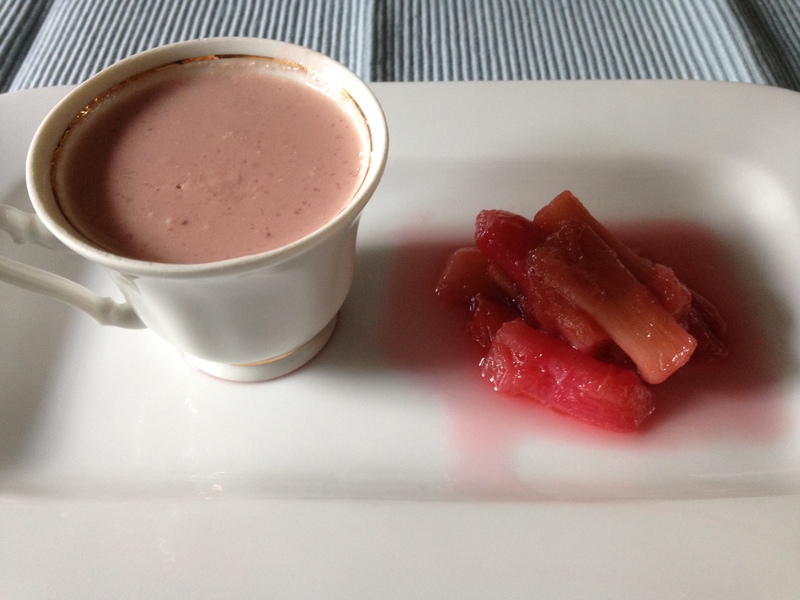 Dusky pink and pillow soft set in a little coffee cup, served with some poached rhubarb in rose water. Achieving 5 a day have never seemed so easy and Rachel’s book is filled with recipes for breakfast, fruit shakes, lunch, supper, health giving stews (Greek Penicillin) and tea time treats such as Apple Peanut Butter muffins. Think my Saturday might have to include the Spanakopita Toastie. If getting your five a day is as tasty as this, then I think that I could get used to more of it, dear Reader! This entry was posted in Margot's Country Snippets, Recipes from Margot's Kitchen and tagged #fiveaday, Abel and Cole, Chloe Chickpeas with Spiced Lamb Skewers and Herb Yogurt, Dinner a deux, eating five a day, Ebury Publishing, espresso mushrooms with tagliatelle, Feeding the hordes, grapefruit and ginger tea, happy foodie challenge, hidden vegetables, Kitchen suppers, less meat more veg, meat free recipes, Rachel de Thample, Rachel de Thample's Five, recipes, The Happy Foodie, vegetarian on February 6, 2015 by admin.